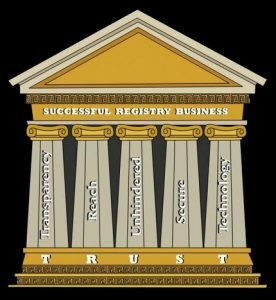 Greg McNair, Ken Hanson, and Paul Goldstone announced today at Domain Name Wire, that they were starting a registry on co.com. I wish Paul, Ken, and Greg the best in their new venture. I can’t think of three more capable individuals to make this a success. There are some skeptics in the comments section and I’d like to address them because this is a subject very close to my heart. I spent many years doing something like what these guys are attempting now. TLD Confusion and Real Domains? We are coming into an age where consumers will have more choices than ever before (in the domain name industry) and some confusion is going to be part of it no matter how you slice it. But the average educated person can tell the difference between those three suffixes by the end of third grade. It’s also not fair to call a sub-domain “not a real domain extension”. They are as real as any other, and they follow the exact principals laid out in the original RFCs for domain names. Numerous countries around the world have built their registries using second and third level domains. Third-Level domain names are as real as any. No one can argue with the success that CentralNic enjoys today. The keys to success for any registry in the coming years will be 1.) good suffix choices, 2.) establishing trust, and 3.) establishing partnerships. Co.com is an obvious good suffix choice. The string, “co” is used all over the world and represents several excellent and useful meanings. It can mean “company”, “corporation”, or even “country” (in addition to meaning “Columbia”). At least 50 ccTLDs actively use the string around the world. It is an established and known string of characters. Most of the CentralNic’s criticism came from industry purists who were short-sighted and who felt that a domain must be a Top Level Domain and backed directly by some accrediting authority to be legitimately useful. CentralNic’s customers (end-user registrants) loved their us.com and uk.com domain names and they were as useful as any other. They worked for email. They worked for websites, FTP, and any other normal Internet protocols. End users easily related to the short and familiar two-letter representation of their countries. That was the real key however. The suffix has to be short, useful, far-reaching, and instantly-related-to by end users. Trying to build a registry on a domain like coffecups.com isn’t likely to succeed. When registrars show your suffix to end users, they need to want them. It’s as simple as that. Who is behind a domain extension? This question is deserving of legitimate debate. It’s a question of if they can be trusted and if the commitment of that individual or organization is real. Although ccTLDs are backed by governments, some governments are more trustworthy than others and there are a few in the world that I would trust less than a corporate entity such as this one. At CentralNic, our principals had to prove over many years that they were solidly committed to the domain name industry and to their clients (which included registrars and registrants). They never interfered with that commitment and because of that we were able to build a long-term very successful business. Registrants and registrars began to trust us with their business. Our CTO, Gavin Brown, was also a key component. He has become one of the most trusted and competent technology professionals in the domain name world. Registrars trusted him to get things done correctly. There is no way that company could have grown as it did without someone like Gavin at the helm of registry system. I have known each of the individuals behind this effort for over ten years and certainly trust each of them implicitly. This is a solid team of domain name professionals with a very good track record. CentralNic would have gone nowhere without great registrar partners. It took us years to develop them and years to integrate them. Without those partners CentralNic would have been part of the ash heap of other third-level registries. I don’t think a new registry can succeed without the registrar channel behind them. Trying to go it alone with just one website for distribution would not have worked and I don’t think it will work today. Fortunately, these principals are well connected in the industry. The biggest risk faced by this new venture is that our industry is entering a new phase where choices and competition will abound. New TLDs will dilute the market and distract registrars over the coming years. It might be hard to get their attention. Of course, end-user acceptance is always a risk. But I am betting that if co.com can get the attention of registrars, that end users will like the suffix. I wish Ken, Greg, and Paul the very best. Note: I don’t work for CentralNic any longer. I now work for one of my all-time favorite registrar clients, 101domain.com. I will however, always be proud of the role I played in their growth. I also don’t take credit for it’s success. We had amazing people there like Robert Pooke, Dan Schindler, Ben Crawford, Jenny White, Mar Perez, and others (who I apologize for not mentioning here or who, I think, might prefer to remain private). We did something that no one thought could be done and grew a business from literally nothing (just several really neat domain names) into an international industry force). Joe Alagna is a Director of Business Development at the leading Registry Service Provider, Afilias. He is an expert in all aspects of the domain name business, including domain name investing, new gTLDs, registrars, and registries. Before the domain name business, he negotiated national accounts contracts for AT&T Wireless. Joe can be reached by phone at +1 (909) 606-9175 or via email using the contact form on this site.